When I saw this classic hit by Roy Orbison it made my heart dance. I don't think there is a woman today would not love to hear this song sang.. knowing they were singing about them. I have seen lives transformed with our custom designed anti-aging supplement program. 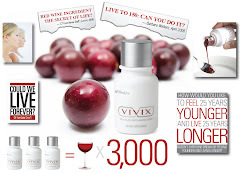 Isn't it about time you did your homework on resveratrol, anti-aging tonic we call Vivix and Shaklee? Trust me you'll be glad you did.